The number of skilled applicants for Digital and Data role in our regions is slowly rising, but it's not growing nearly as quickly as Digital and Data vacancies in technology companies are - there is a growing talent gap which has no sign of slowing down. The graphs below visualise this growing talent gap we've seen over the past two years at Darwin - both in Europe & the USA and the growing number of passive candidates in the market. These passive candidates can only be reached by direct recruitment methods. Our Market Updates include information on how long it takes to fill a position, how many candidates were local, how many spoke the local language, and what the average salary ranges were - all broken down into individual technologies like Data Science, Data Engineering, Frontend, Backend Blockchain and more. We also compare figures to previous Market Updates to show how the market is evolving and where the demand is. 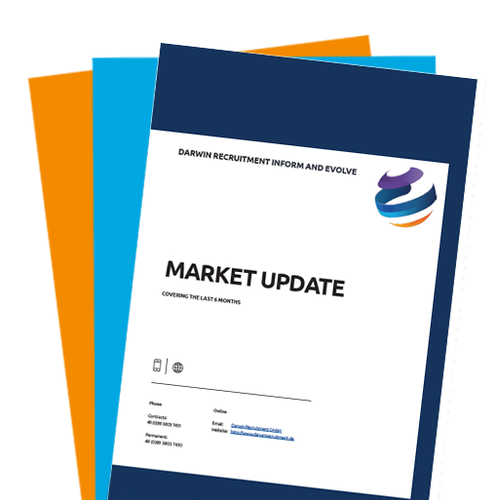 We have multiple Market Updates based on the major locations we recruit in: Berlin, Hamburg, Munich, Denmark, Norway, Sweden, Switzerland, the Netherlands, New York & Boston. We have a large team of Data recruitment specialists spread across the globe. Each consultant truly understands their market and the technology they recruit for. Don't believe us? Check out their profile and read what their candidates and clients say about them.